Astronaut and space travel lovers—this is for you. 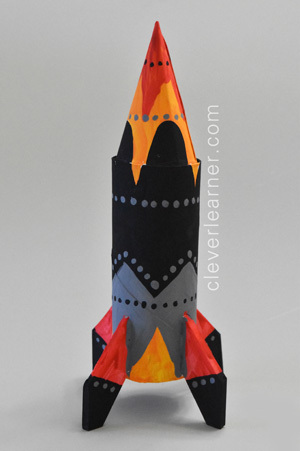 In this 100 minutes craft time, we shall transform a paper roll (from a finished toilet paper) into a colorful space rocket. A flexible card, from which we can get a 7inch diameter circle, a 4x2inch mount board (to be used for the stands of the rocket), and of course leftover the roll from a toilet paper! To fix the top part of the shuttle, we need a cone. 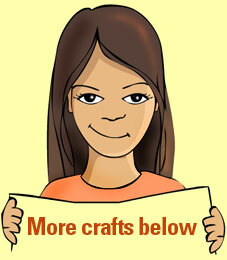 From the flexible card, cut out a circle of about 7 inches in diameter. Cut off half of it, through the middle. If you are not sure where the mid point is, just fold the circle into 4, open it up and cut of half of the circle. Using the dry Elmer’s roller glue, stick one side of the straight edge to the other side to make the cone. Tuck the pointed part of the cone into the paper roll and mark out the part that is outside of the roll. This is the excess (not needed) part of the cone — cut that part off. 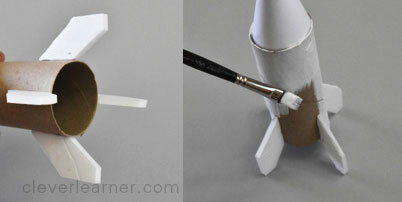 Apply some dry glue to the round base of the cone and push it into the paper roll. Play around that until it sits nicely into the roll. You can pour some pvc glue into the joint area to make it is even more solid. Wait for it to dry. Whiles you wait, cut out four pieces of the mounting board, to the size of 2x1inch. To make the stands of the rocket, cut off the bits of two opposite corners of each piece. When the roll and cone is dry, fix all our stands with dry glue. This part needs a bit of patience, so wait till one stand is holding well before you stick the other. The rocket is done at this point, technically. Now is the time to make it beautiful with color. With a good acrylic pint, prime the entire rocket with white color and wait till it is dry. Then think of your own color scheme that you want to use. Carefully paint it starting from top to bottom. The neat thing is that, depending on your level, you can make the design very intricate and paint in a bit more detail. It is entirely up to you. Most importantly, have fun doing this and make sure to release your creative juices, push yourself to do more than this demo is showing.